A seemingly unambiguous statement about diversity in comic books has proven surprisingly easy to misinterpret. The Daily Mail, the notoriously sensationalist British newspaper, has managed to get people talking about how the new Spider-Man could possibly be gay, after seemingly misinterpreting a quote from artist Sara Pichelli, who designed the character's new look. The new Spider-Man is Miles Morales, a half-black and half-Hispanic teenager who takes on the Spider-man mantel after the death of Peter Parker in Marvel's Ultimate continuity. Speaking to USA Today, which was given the scoop about the change, Pichelli said that she could envision a future where more diverse comic book characters wouldn't be a big deal. "Maybe sooner or later," she said, "a black or gay - or both - hero will be considered something absolutely normal." 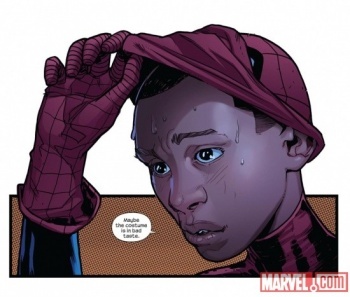 The Mail interpreted this comment as Marvel saying that it might one day make its new Spider-man gay, in an article that bore the headline "Marvel Comics reveals the new Spider Man is black - and he could be gay in the future." The paper also neglected to mention that it only applied to the Ultimate continuity until the latter part of the article. Other outlets have since picked up this version of the story, where it has garnered mixed responses. While Pichelli's comment doesn't seem particularly ambiguous, it's entirely possible that the Mail simply misinterpreted it. However, it's hard to ignore the fact that including the gay angle in the headline has generated a lot more interest in the story. If this is a cynical attempt to get hits - and I'd really prefer to give the Mail the benefit of the doubt here - it's rather sad, because it ignores the fact that Marvel's has been trying to make the Ultimate universe a more inclusive place for years. While Spider-Man is the highest profile character to get a new ethnicity, he's definitely not the first; the Ultimate universe is where the Samuel L. Jackson-inspired black Nick Fury - later played by Jackson himself in several Marvel movies - first appeared, for example. Implying that the new, mixed race Spider-Man is some kind of publicity stunt, or tokenism inspired by political correctness, misrepresents and undermines Marvel's laudable efforts.